Getting kids to finish their vegetables can be a struggle many parents are familiar with, but teaching kids to make healthy choices doesn’t have to be a fight. “We’re all busy with work and family. The last thing we want to do is have a battle at dinner time,” said Garen Schroder, RDN, LDN. As a nutritionist who specializes in working with children and families at OSF HealthCare Children’s Hospital of Illinois, Garen has some advice for parents who want their kids to eat more healthy foods at home. As parents, we want to raise children to be independent, critical thinkers, so don’t limit them to just the kid’s menu. Let kids try new foods, but don’t force the issue. Instead, give them the option to try something new without pressuring or reprimanding them, and don’t overact if they don’t try it or don’t like it right away. Choosing what to eat should be a practical, rather than an emotional choice. 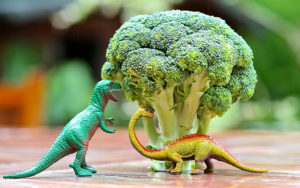 Pressuring kids to finish their broccoli can make it feel even more like a chore, while bribing them with a cookie can make them seem even sweeter. “I think it’s so important for parents to be matter of fact about food. It’s our job as adults to provide full nutrition. Don’t reward good behavior or eating vegetables with treats because it makes the sweets more desirable,” Garen said. Occasional desserts are great, Garen said, but they don’t need to come with fanfare. A child’s interest in new foods can start at the grocery store. Ask them to choose one new item to try, then bring it home and ask them to help you prepare it. “Cooking with kids definitely can be messy, but it shouldn’t be something that’s burdensome. It should be fun, and that’s something the holidays are all about,” Garen said. Even children as young as 3 to 4 years old can help with basic washing and mixing. Remember to be patient, as well. Don’t be surprised or discouraged if your child doesn’t take to something right away. “It’s not reasonable for us to expect kids to like something the first time,” Garen said. Keep introducing new foods and foods prepared in new ways. Offer fruits and veggies fresh, frozen or incorporated into another dish. Make them a fun shape. Or give kids two healthy options and let them choose what they’d like to eat. Make dinner time an opportunity for the family to slow down and re-connect. Consider banning phones or television during meal time, and instead start a conversation with your kids about their day or what happened at school. Holidays are a great opportunity to start a tradition of coming together over a meal. Find more resources for raising health kids on the Healthy Kids U web page. Do your kids want a quick and healthy breakfast? 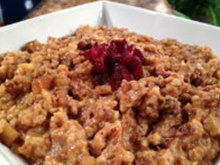 Try this slow cooker oatmeal that you can make overnight and have leftovers for the rest of the week! 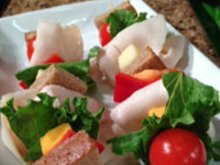 Get the kids involved in making their own snack on a stick! Are you craving the flavors of a cheeseburger and you love pasta too? 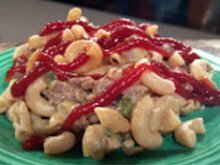 Try this spin on an American classic that tastes like the real deal without all the calories! 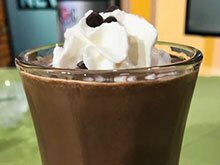 Try this healthy spin on a classic chocolate milkshake. You will not even know it was made without ice cream! 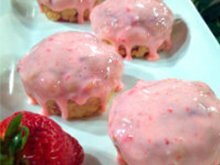 These muffins are better for you, and have less calories and fat than your typical store-bought muffins!